This massively strong 12 spoke Rally Raid style alloy wheel has a load rating of 1450kg suitable for on road and heavy off road use. 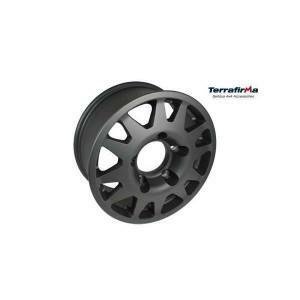 Influenced by the rugged and stylish wheels used on Dakar rally raid vehicles the new Terrafirma Dakar wheel looks amazing in either satin black or silver and is super strong with a massive 1450kg load rating. Available in 7x16 and 5/165 bolt pattern using original alloy wheel nuts, the Dakar wheel is a 12 spoke wheel with built in valve protection against rocks and ruts and is suitable for the heaviest off road use when fitted to Land Rover Defender, Discovery 1 and Range Rover Classic. With +33mm off set the Terrafirma Dakar wheel allows large diameter tyres to be fitted without compromising steering lock as well as giving a wide stance appearance to your land Rover. Terrafirma Dakar 7x16 alloy wheels, again following the success of the Defender version the Dakar wheel is now available in 5x120 stud pattern with a 45mm offset for Discovery 2 and P38. With a massive 1450kg load rating these must be the strongest wheel for this vehicle on the market.